Last week I invited you to participate in a charity auction at Fishbowl. This week I invite you to attend three more exciting events. 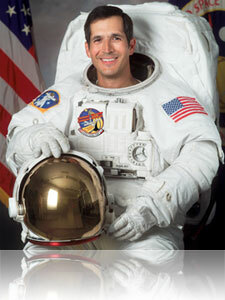 John Herrington, the first Native American to travel into space, is coming to Utah Valley University and Fishbowl to speak to community leaders and students. He has an amazing story to tell of reaching great heights against all odds. Webinar: Commander Herrington connects Navajo and Utah National Science Foundation students in the webinar “Connecting Community on Lines of Light.” Wednesday, February 23 at 6:30 p.m. Speech: Commander Herrington gives the keynote speech “Learning to Soar” at a UVU event. Thursday, February 24 at 1:00 p.m. at UVU’s Student Center Room 206C. Dinner: Enjoy a traditional Navajo potluck dinner at Fishbowl with Commander Herrington, community leaders and students. The event is called “Working Together with an Uncommon Generosity of Spirit and Light.” Thursday, February 24 at 5:30 p.m. in Fishbowl’s main lobby. Email Fishbowl President Mary Scott to RSVP and receive additional information. He was born on September 14, 1958 in Wetumka, Oklahoma. He moved several times as a child, growing up in Colorado, Wyoming and Texas. He’s now married and has two children. His hobbies include flying, rock climbing, snow skiing, running and cycling. He joined the U.S. Navy in 1984 and performed a variety of functions over the years. He has logged more than 4,000 flight hours in more than 30 types of aircraft. In 1996, Commander Herrington was selected join NASA’s space program. After a few years of training and hard work, he became the first Native American to leave the earth’s atmosphere in 2002. He is a member of the Chickasaw Nation. After retiring from NASA in 2005, he has dedicated much of his time to lifting others up. We’re excited to welcome Commander Herrington to Fishbowl and UVU. We hope you’ll join us!